This dish is summer: light, clean, and has bright flavor. Take this dish with you to a barbecue. It also makes a nice addition to a shower menu. The recipe is simple to prepare in its entirety. Enjoy. Take oven rack and place it in the highest slot (right underneath the coils). Preheat oven 450 degrees. Place tomatoes in a medium bowl. Stir in basil, garlic, vinegar, oil (feel free to taste and adjust here). Salt and pepper to taste. Cover and set aside. Slice baguette into 1/2 inch slices on the diagonal. Place sliced baguette onto a rimmed baking sheet. Lightly brush the tops of each slice with olive oil. When oven has reached 450 degrees, toast baguette slices (in the highest slot of oven) for 5-6 minutes or until golden brown (keep an eye on them). Remove from oven and allow to cool. 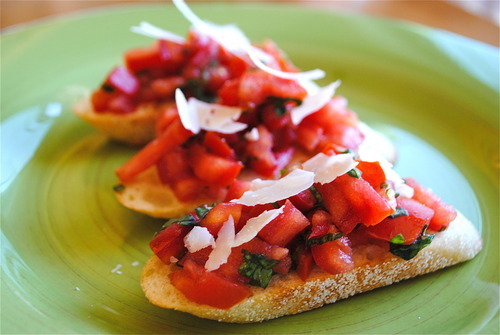 Take tomato basil mixture and scoop by tablespoonfuls onto the tops of each toasted slice. Finish with shaved parmesan. Serve on a platter. You could also serve the tomato basil mixture in a bowl with a spoon and dish onto the toasted slices at will. Tomato and basil mixture will last covered in your fridge up to 2-3 days.